From the old-time country-tingled feel of "The Bender," a whispering, whiskey-soaked folk number that will blind you with its soft, relaxed sting through the "Heatwave Marchingband Soldier", a dark, staggering folk piece, Granfaloon Bus manages to capture both the charm of indie lo-fi-ness and the timeless-ness of old time recordings. 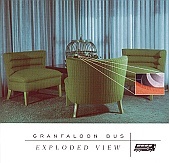 A personable, warm, gripping collection of songs and tales, Granfaloon Bus' Exploded View is about as refreshing and crisp as they come. It allows the guitar and vocals to lead the way as the light rhythm section and occasional add-on (horns, etc.) deliver a punch to each song they hit. Granfaloon Bus takes you back to a time when music was pure an innocent, about a story and a song, rather than an agenda and proving a point. This is beauty in its most natural state. I'll give this an A+.